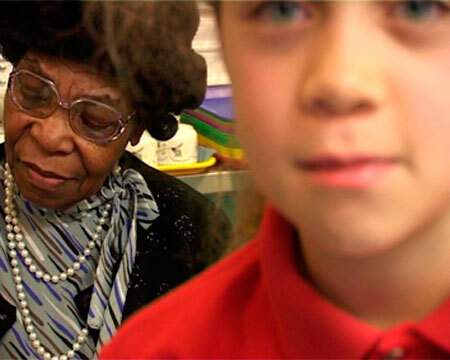 I worked with Treasure Films on two intergenerational film projects funded by Awards for All. Both involved a primary school collaborating with local older people on a 10-week project to research, film, edit and screen a short documentary of local interest. It was very 'hands-on' and everyone learned new practical skills, such as interviewing, filming and poster design. Welcome to England focuses on the older people's experiences of moving to England and helping to shape their communities. African and Caribbean elders attending the PepperPot Day Centre in Ladbroke Grove shared their experiences with 11-year-old pupils at Middle Row Primary School. Memories of War was made by 10-year-old pupils at Campsbourne Primary School, Hornsey with ex-teachers and nearby residents who remembered the area during WW2.